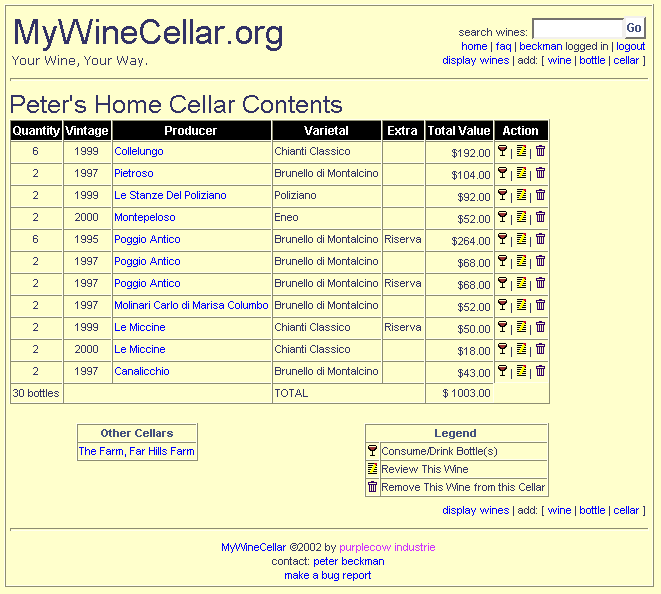 MyWineCellar.org is a FREE service provided by Peter Beckman. If you want to know more, you can read the FAQ. To get started, Register or Login. Currently you can create a complete list of all wines in multiple wine cellars. For example, if you have a cellar at home, at the vacation house, and at your favorite restaurant, you can keep track of the number and amount paid for each cellar. In the near future (+/- a month or so), you will be able to 'drink', 'gift' and 'review' your wines, as well as add 'events' at which you consumed wines, whether they were in your cellar or not. You will be able to make your reviews public or keep them private. We'll also hopefully get some ratings from different places in the system as well. Please let me know if you have comments, suggestions, or find bugs!